Nonso Anozie is a British actor who has appeared in several stage plays and four films to date. In the summer of 2002 he became the youngest person in history to play William Shakespeare's "King Lear" and won the Ian Charleson Award in 2005 for his performance as Othello. "It was a studio decision... You can understand why you would cast Ian McKellen for anything. But letting go of Nonso was one of the most painful experiences on this movie for me. I need to say about Nonso that he is one of the most promising and soulful young actors I have encountered in England and I’ve worked here for quite a bit now and he’s actually in the next Mike Leigh ...But it was, uh, that was kind of a dark day for me. I kinda wanna go out of my way to point out how much I love Nonso’s work. And that’s that." He played small roles as Think Tank in Guy Ritchie's film RocknRolla and Frank Mace in Joe Wright's Atonement. 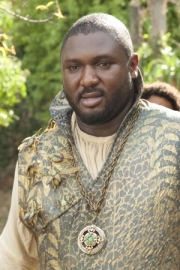 In 2009 Anozie appeared in the supporting cast of the BBC TV three part 2003 Iraq War drama, Occupation, where he plays a US Marine turned private military contractor. In 2011, he played Artus, a Zamoran pirate and close friend of Conan, in Conan the Barbarian. That year he was also cast to play the role of Xaro Xhoan Daxos in the upcoming HBO sequel to Game of Thrones. Whole or part of the information contained in this card come from the Wikipedia article "Nonso Anozie", licensed under CC-BY-SA full list of contributors here.